In a world that blends flamboyant costumes with decidedly bland personalities, figure skater Christopher Bowman stood out for his irrepressible individuality and unapologetic, undisciplined approach to the sport. He was one of the skating world's best performers. "He was an extraordinary talent who had wit, intelligence and charm," said his long-time coach Frank Carroll. But Bowman's life was as erratic as his athleticism. Following his retirement from skating in 1992, Bowman returned periodically to the sport, as a coach and commentator. But he was never far from controversy: he was arrested in 2004 when a friend reported he had pointed a loaded gun at her while he had been drinking. And, on Jan. 10, the two-time U.S. champion and Olympic team member was found dead in a hotel in the San Fernando Valley. He was 40 years old. Police are investigating the death as a possible drug overdose. "This is hard on me, and I'm not totally in charge of my emotions," Carroll told TIME. "It's interesting how you can have a love-hate relationship with somebody and love them, care about them and at the same time, despise the dark side of them that comes about for whatever reason. [That dark side] was disgusting, and basically destroyed a very lovely human being," he said about Bowman's decades of drug abuse. Nicknamed "Bowman the Showman" for his crowd-pleasing exuberance on the ice, the California native was a talented skater whose party-boy lifestyle and drug use off the ice got in the way of the discipline needed to train as a world-class athlete. Prior to his first Olympic appearance in 1998, Bowman checked himself into the Betty Ford Clinic to treat his drug habit, one of at least two times he received treatment for his addiction. "I've told myself I'd be more disciplined," he once said. "It just never seems to work that way." When Bowman won the silver medal at the World Championships in 1989, Carroll, for one, was torn between feeling proud and guilty. "I remember people coming up to me and congratulating me, saying 'Oh, your boy is wonderful, we just love watching him, and he has so much charisma,'" says Carroll. "But inside I was just dying, I was in so much pain because I hadn't seen him for weeks before we left, and the program he was doing  I felt like it was not what this boy could do. I was really in despair because he was also doing drugs." The sting was especially harsh for Carroll, who is close to Bowman's mother, Joyce, and had coached Bowman for 18 years. The two began lessons when Bowman was five, and Carroll, remembers first laying eyes on baby Christopher and thinking, "this is the most perfect child I've ever seen." Bowman's contemporaries and rivals in the late 1980s and early 1990s were the heavyweights of the figure skating world: Olympic medalist Paul Wylie, world champion Todd Eldredge, and national medalist Mark Mitchell. Mitchell, who was always surprised by Bowman's ability to compete at the highest level despite his haphazard training schedule, says "the locker room was always very entertaining" when Bowman was around. One of Bowman's favorite stories, with which he regaled teammates over and over again, highlighted his complicated relationship with Carroll. A day after sitting down with Carroll to be lectured on the importance of eating right for an elite athlete, Bowman stocked up on three boxes of doughnuts, which his mother discovered under his bed and promptly brought to the rink. Carroll forced the skater to eat the entire stash  and then put him through a lesson on spins until he threw up. "He loved telling that one," says Mitchell. 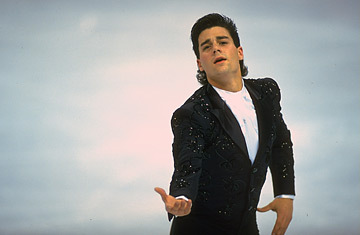 Perhaps Bowman's most memorable performance, however, wasn't a feat of skating grace or athletic prowess; it was a shockingly impromptu expression of desperation and determination at the World Figure Skating Championships in 1990. The last two minutes of his long program were "not a pleasant experience," recalls Carroll. Having botched two jump combinations already, Bowman ad-libbed the remainder of his performance, throwing in unplanned jumps in a frenetic attempt to boost his standings. In the strictly conscribed world of competitive figure skating, in which every note of music and each body position on the ice is choreographed to the last detail, such improvisation is anathema, if not disastrous. But it was classic Bowman. He said afterwards: "I had an attack, a strategy, the heart, soul and aggressiveness to challenge." It worked, earning him a bronze medal. It did not, however, make Carroll happy. After years of battling Bowman to train properly, he had finally had enough. "You can't train someone who's untrainable or coach someone who's uncoachable," an exasperated Carroll said following the competition. "I don't see any point in going on like he is now, I really don't." Frustrated at not being able to help Bowman, Carroll decided to cut off all contact with the skater. "I felt that I needed to use a tough love approach, that if I didn't help him, didn't enable him, that it was a statement that you have to stop doing drugs if you want me in your life," says Carroll. Despite the rebuffs, Bowman continued to email his coach, imploring him at one point just about six months ago, "Come on, Frank, give in." And then the news of his death broke. Carroll thinks about the times he tolerated Bowman's erratic behavior, visiting the then teen-age athlete at the treatment center, bringing him clothes, and the years of struggle after. Says Carroll: "It's such a helpless feeling, when everything you think you've done has done nothing in the long run."